Who brought onto the written page, the hilarious adventures of Jennings and his school chums at Linbury Court School. What is there to say about Mr Buckeridge. A superb author, his books have warmth and humour and some great characters. Anthony Malcolm Buckeridge was born in the year 1912 in London. His main education was at Seaford College, West Sussex then London University. He worked in the fire service and as a preparatory school master, from which he would relate his early Jennings stories to the pupils. In 1948 he submitted a Jennings script to the BBC. 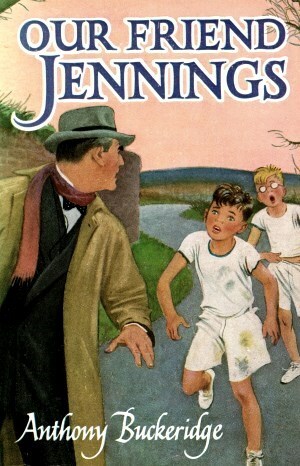 In 1950 Jennings was launched to the world in the written word. During the 50's Jennings featured on radio and television. Bring it back I hear you cry! My memories of Jennings and his hilarious antics at Linbury Court fill my youth, starting from the age of 10. The year was 1967 and I was laid up in bed, poorly sick with the measles with very little to read. We had very few books in the house, most being in a glass cabinet in my parents bedroom. It was my eldest sister who opened the said cabinet and on the second shelf was our one and only Jennings book. It was in good condition with no dust jacket. I was a bit reluctant to read at that time feeling so unwell, but by the end of the day I felt so much better. I didn't want to put the book down, it was by far the best thing I had ever read. I remember waking next morning with the book next to me and I finished it that day. When better I explored the school library to find more; Especially Jennings was my second and Jennings Abounding my third. When I had saved enough pocket-money I would buy my next Jennings paperback. Couldn't afford a hard back edition! They were just 2/6 in those days. I remember bounding up the stairs to the second floor of the bookstore in town to find what titles were ready for me on the shelf. Jennings and Darbishire, Jennings Little Hut, Take Jennings For Instance and more. My crowning glory that Christmas, my mother bought me; A Bookful Of Jennings. What a big book. And thanks Mum! Wonderful days Mr Buckeridge you made a ten-year-old boy and in proceeding years very happy. And that very first book I read while poorly is still my favourite. It is...Jennings Follows A Clue.